After three overall lackluster mornings of birding following the passage of a moderate cold front, failing to stumble across a western vagrant or at least a Cave Swallow, I was not planning on birding today. The weekend produced two Parasitic Jaegers and a $%*& ton of Laughing Gulls, but otherwise was not terribly birdy. Sure, there were some birds to be seen. A small movement of waterfowl on Saturday morning was followed by a so-so hawk flight on Sunday. Monday (yesterday) was pretty dead all-around. Yes, I'm complaining a bit. I really shouldn't be...I mean, it's just birding, and it's great to be out at all...but 1) this autumn's migration has overall been very slow locally, and 2) November has the potential to be so exciting because of its track record for producing truly rare birds. I woke up today to overcast skies, a breeze from the ENE, and threatening rain. After seeing that the steady rain should hold off for at least a few hours I decided to head to Stratford Point for a seawatch before being productive for the remainder of the day, taking care of errands and whatnot that I had postponed to spend time in the field before work each of the past few days. One of my goals for the day was to visit Frank Gallo, longtime birding friend who recently ruptured his quad tendon and is rehabbing post-surgery. Frank got in touch with me while I was at Stratford Point (seeing very little) and expressed interest in looking for the Hudsonian Godwit that had been hanging around Stratford. Frank was getting a bit stir crazy and needed some fresh air. So I went to fetch him and we headed out after a really good homemade cappuccino courtesy of Mr. Gallo himself. Yeah, life can be really tough sometimes. By now the rain was starting to spit like Frank's subcutaneous sutures, which was really no problem because Frank (hereafter "Gimpy") was confined to car-side birding anyway. Our first stop at Stratford Marina yielded the long-staying injured Hudsonian Godwit, which is walking no more quickly than Gimpy himself thanks to a swollen left leg and right foot. Sixty Greater Yellowlegs here were a nice seasonal count for the state. C'mon Spotted Redshank! Anyway, we bumped into Frank Mantlik at the nearby Birdseye Boat Ramp who was doing the same birding-by-car-in-the-rain thing we were doing. We chatted and joked about finding various rare birds which happened to include Franklin's Gull. 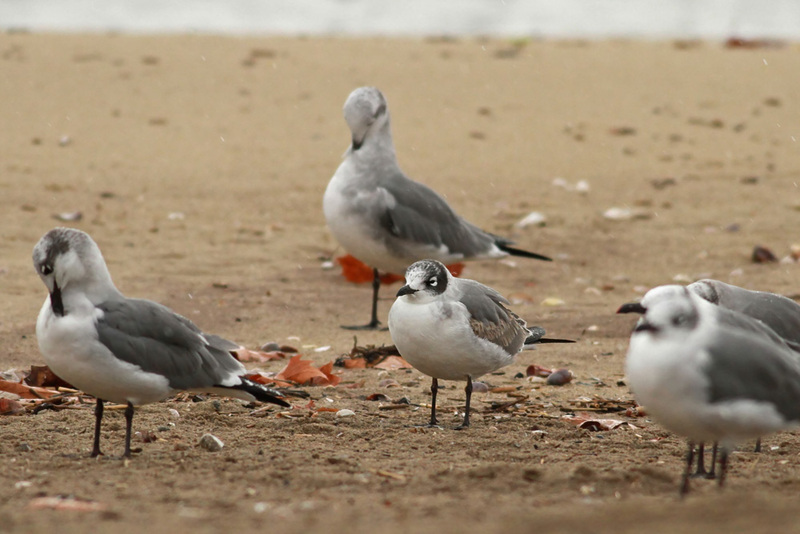 Mantlik recounted his story of finding the state's third Franklin's Gull at this time of year back in 1998 (actually, his now-wife Linda spotted the thing). The state's fourth was seen one year later, in Oct-Nov of 1999. No sightings since then, though. Gallo...err...Gimpy and I next drove down the parking lot at Long Beach, where we looked onshore and off for a few minutes. Frank spotted an Orange-crowned Warbler in the dunes adjacent to the parking lot - nice! It was not yet noon, so we had a bit of time before Frank needed to get back home. I threw out the idea of running over to Seaside Park in Bridgeport to check the lawns for gulls, geese, and open country birds. Frank was up for it, so we headed there as the rain intensified. Not much was on the pond...some Brant, a few Hooded Mergs, and some Black Ducks and Mallards including an obvious hybrid. As we pulled away from the pond, I told Frank with a smile "Now the Franklin's Gull is going to be on the other side of the park." He nodded yes. We make stupid predictions like this all the time. They pretty much never actually come true. So we drove along the shore road and stopped at the first flock of gulls we found on the beach. It didn't take long to see that one of the preening Laughers was retaining a bit of a hood...could it be? 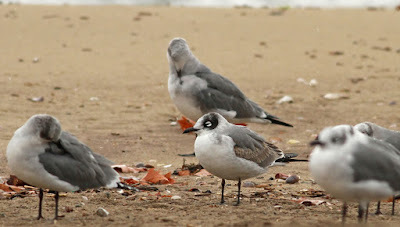 Yup, FRANKLIN'S GULL. Boom! as the kids say. Frank and I high-fived one another, and he started a series of phone calls and texts while I got some record photos. We retreated to the car to dry our equipment and continue to pass the word. 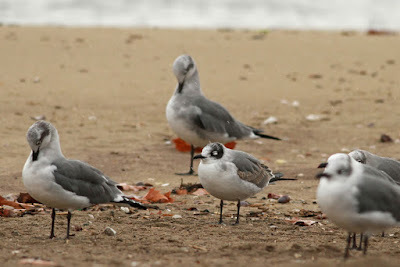 Unfortunately the gulls began to peel off from the roost one-by-one to feed in Long Island Sound, where there have been regular LAGU-dominated feeding frenzies going on for several weeks now. Frank and I took a spin around the park without refinding the gull, and soon other birders took over. It does not sound like the bird was relocated, though it is likely still in the area somewhere, alternating between feeding offshore and roosting. This first cycle bird is just the fifth Connecticut record, a number that is shockingly low to me given that it is seen in some neighboring states much more regularly.